Foot, Richard. "The Stanley Flag". The Canadian Encyclopedia, 15 August 2016, Historica Canada. https://www.thecanadianencyclopedia.ca/en/article/the-stanley-flag. Accessed 21 April 2019. Prime Minister Lester Pearson and John Matheson, one of his Liberal MPs, are widely considered the fathers of the Canadian flag. Their names will be front and centre in 2015 during the tributes and celebrations to mark the 50th anniversary of the flag's creation. But sometimes lost in the story of how this iconic symbol came to be is the role played by George Stanley, an eminent historian and one-time lieutenant-governor of New Brunswick who, during the great flag debate of 1964, was dean of arts at Royal Military College in Kingston, Ontario. Stanley was also a friend of Matheson — the MP for nearby Leeds and an influential member of an all-party parliamentary committee tasked with choosing a new flag. On 23 March that year, Stanley wrote to Matheson outlining his ideas for what the flag should represent and what it should look like. At the end of his now historic letter he sketched the first-ever representation of what would become the chosen flag — a six-centimetre-long, hand-drawn rectangle in red ink, with red bars on each side, and in the middle on a white background, a single maple leaf. The committee was by then inundated with suggestions from across the country for a new flag. 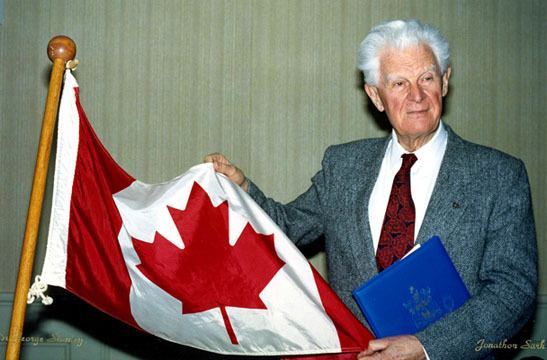 Conservative Opposition Leader John Diefenbaker, plus thousands of war veterans who had fought for Canada under the old Red Ensign — a flag bearing the Union Jack and the Canadian coat of arms — opposed any change to the status quo. 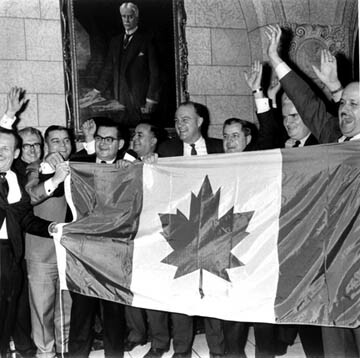 Diefenbaker also favoured a flag showing the symbols of Canada's "founding races." Pearson himself was fond of a design by heraldry expert Alan Beddoe; the Pearson Pennant, as it was dubbed, featured three maple leaves on a white background with vertical blue bars on either side, representing "From sea to sea." But no design was as straightforward and elegant as Stanley's. Most importantly, his proposal avoided any references to founding races, or the colonial past, or any other source of potential controversy, especially at a time when Québec nationalism was on the rise in the midst of the Quiet Revolution, and the FLQ was then placing bombs in mailboxes. 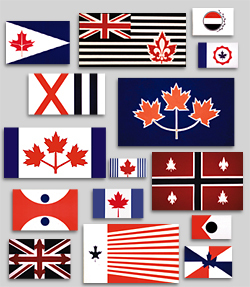 One of Pearson's aims in adopting a new flag was to remove symbols, such as the Red Ensign, that inflamed Québec nationalists and threatened Canadian unity. 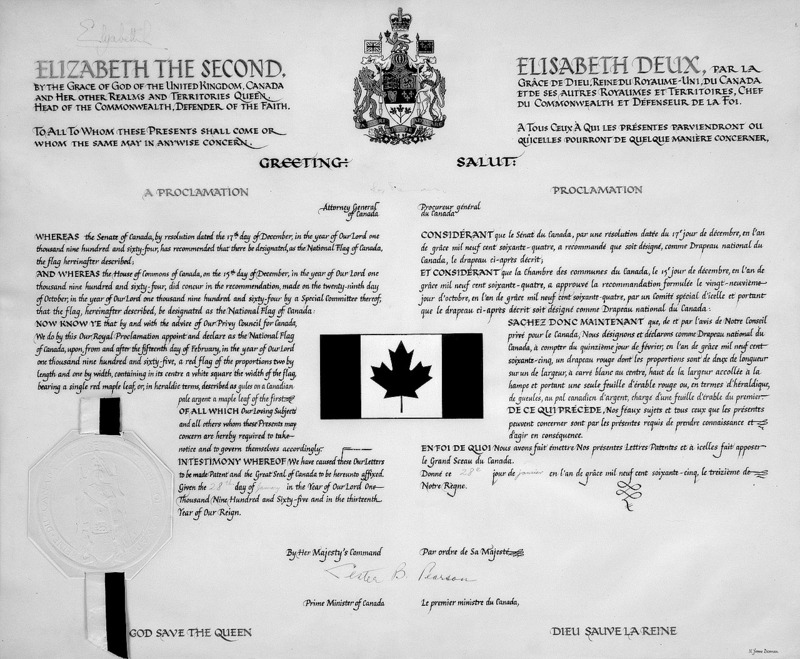 In his letter to Matheson, Stanley said that a new flag "must avoid the use of national or racial symbols that are of a divisive nature,” and that the “single leaf has the virtue of simplicity; it emphasizes the distinctive Canadian symbol; and suggests the idea of loyalty to a single country." Stanley's inspiration had actually come from the Royal Military College flag — two red vertical stripes bookending a white centre on which an armoured fist holds three maple leaves beneath a royal crown. Stanley simply replaced the centre elements with a stylized maple leaf. A more professional drawing of Stanley's crude sketch was eventually made, to be included among the many designs being considered by the committee, which had become deadlocked on the matter. As pressure mounted, Stanley's design won out, partly thanks to Matheson's backing, but also because of its simplicity; it afforded a compromise between those who wanted the Pearson Pennant and those who favoured either more complicated designs or the Red Ensign. Parliament approved the Stanley flag on 15 December 1964 and it was officially run up a government flag pole in Ottawa on 15 February the following year. Stanley's letter to Matheson, however, with its conceptual drawing, ended up in the papers of Alan Beddoe, of all people, who had designed the discarded Pearson Pennant. It was apparently lost to history for several decades, its whereabouts unknown, until a researcher named Glenn Wright stumbled across it in a cardboard box of documents at the National Archives in Ottawa. "When I turned the page and saw that sketch, it was very emotional," Wright told Ottawa Citizen reporter Randy Boswell, who wrote about Wright's discovery in 2002. "This is certainly the genesis of the Canadian flag." The main players in the flag saga are now gone. Pearson died in 1972, Stanley in 2002 and Matheson in 2013. But what they created has lasted for nearly half a century and counting — flown from the top of the Peace Tower and from thousands of public and private buildings across the country, from embassies around the world, and recently, at Olympic medal ceremonies in Sochi, Russia. The Stanley flag is now a universally recognized Canadian symbol. As Boswell pointed out in his article: "'A flag,' [Stanley] would later write, 'speaks for the people of a nation or community. It expresses their rejoicing when it is raised on holidays or special occasions. It expresses their sorrow when it flies at half-mast. It honours those who have given their services to the state when it is draped over their coffins. It silently calls all men and women to the service of the land in which they live. It inspires self-sacrifice, loyalty and devotion.'" Dr. George F.G. Stanley's Flag MemorandumDigitized copy and transcript of Dr. George F.G. Stanley's 1964 flag memorandum to John Matheson, M.P. From the website for St. Francis Xavier University. Royal ProclamationA digital image of the Royal Proclamation document that declares the red maple leaf flag as the National Flag of Canada. From Library and Archives Canada. Flag designer recalls controversyA 1995 CBC Television feature about George Stanley’s role in creating Canada’s distinctive national flag. Flag DayView a brief history of the search for a distinctive Canadian flag. From CPAC. The Great Canadian Flag DebateA CBC News video that shows the Royal Canadian Legion’s raucous reaction to Prime Minister Lester B. Pearson’s 1964 speech about the need for a more distinctively Canadian national flag.